It was a very busy weekend and Monday at the Vatican and also for yours truly as I attended a press conference today (see the Vatican Radio story and my photos below), had several appointments and spent time arranging for a trip to Chicago to participate in the farewell events for the archdiocese’s beloved Cardinal Francis George (and, as you know from these pages, a good friend of mine). I leave Wednesday and will try to keep you updated, as far as time will allow. Lots of news and interesting stories but just three highlights today…. I received an email today from Fr. Joshua Caswell – a priest in Chicago who was ordained by Cardinal George for the Canons Regular of St. John Cantius. We have not met but I have known Fr. Frank Phillips of St. John Cantius for many years. Fr. Joshua included a wonderful link about what he said was the legacy that Cardinal George left behind—the “restoration of the Sacred.” The link was put together by the community, wrote Fr. Joshua, as a “tribute for our spiritual father.” He also quotes Fr. Phillips who says, “We are a living legacy of this shepherd of souls.” From the beginning of the Canons Regular, it was Cardinal George who envisioned that a small community of men founded at a run-down Chicago church would become a flourishing order dedicated to the “Restoration of the Sacred.” http://www.canons-regular.org/go/news/read/cardinal-francis-george-chicago. A beautiful and worthy tribute – and marvelous photos! – to a man for whom the title “Eminence” was richly deserved! (Vatican Radio) Pope Francis has appealed to the international community to take swift and decisive action to avoid more tragedies of migrants seeking a better life. His heartfelt cry to the world came following news of the sinking of yet another boat carrying migrants in the Mediterranean Sea in which it is feared 700 people may be dead. The Pope was speaking on Sunday morning after the Regina Coeli prayer in St. Peter’s Square, where he told tens of thousands of people “They are men and women like us, our brothers seeking a better life, starving, persecuted, wounded, exploited, victims of war. They were looking for a better life”. Faced with such a tragedy – Pope Francis continued – I express my most heartfelt pain and promise to remember the victims and their families in prayer. “I make a heartfelt appeal to the international community to react decisively and quickly to see to it that such tragedies are not repeated,” he said, before asking the crowd to pray “for these brothers and sisters”. The latest disaster happened when a boat carrying migrants capsized off the Libyan coast overnight, in one of the worst disasters seen in the Mediterranean migrant crisis. Just Saturday Pope Francis joined Italian authorities in pressing the European Union to do more to help the country cope with rapidly mounting numbers of desperate people rescued in the Mediterranean during journeys on smugglers’ boats to flee war, persecution or poverty. While hundreds of migrants took their first steps on land in Sicilian ports, dozens more were rescued at sea. Sicilian towns were running out of places to shelter the arrivals, including more than 10,000 in the week ending Saturday. Since the start of 2014, nearly 200,000 people have been rescued at sea by Italy. Italy says it will continue rescuing migrants but demands that the European Union increase assistance to shelter and rescue them. Since most of the migrants want to reach family or other members of their community in northern Europe, Italian governments have pushed for those countries to do more, particularly by taking in the migrants while their requests for asylum or refugee status are examined. (Vatican Radio) The Holy See Press Office was the scene Monday morning for the presentation of a Day of Reflection on the life and legacy of Blessed Junípero Serra – soon to be St. Junípero Serra, after his canonization in Washington, DC, scheduled for September of this year. Capping the Day, which is to focus on the theme: Fra Junípero Serra: Apostle of California, and Witness to Sanctity, is to be the visit of Pope Francis to the Pontifical North American College, host of the event, for Mass in the College chapel. “The highlight of the day, of course, for us, will be the end of the day, when [Pope Francis] comes to celebrate Mass with our community at 12 o’clock,” said the rector of the North American College, Msgr. James Checchio, in an exclusive interview with Vatican Radio ahead of the press conference on Monday. “It’s been quite a few years – thirty-five – since the Successor of Peter has been to the College, so it’s a great moment for us.” he added. Msgr. Checchio also told Vatican Radio about the enduring importance of Bl. Junípero Serra’s spirit of service and sacrifice for the Gospel. “He obviously showed great heroic [valor] and sacrificed himself in the name of evangelization and Jesus Christ,” he explained. “Certainly that’s something of which we need to do more: we need to give all we have,” Msgr. Checchio said. The Day of Reflection is organized by the Pontifical Commission for Latin America, the Archdiocese of Los Angeles, and the Pontifical North American College. Featured speakers are to include: Card. Marc Ouellet, President of the Pontifical Commission for Latin America; Archbishop José H. Gómez of Los Angeles; and Vincenzo Criscuolo, OFM Cap., General Relator of the Congregation for the Causes of Saints. Since Cardinal George’s death Friday at the age of 78, I have spent hours reading tributes to this man who so blessed my life with his friendship and more hours looking through my photo archives for the many pictures I took over the years during his various visits to Rome. There was one remaining visit to Rome on Cardinal George’s list of travels: he so wanted to spend some private, one-on-one time with Pope Francis. The cardinal, of course, was one of the electors in the 2013 conclave and had met the new Pope shortly after his election on March 13 when Francis greeted each member of the College of Cardinals. But they had not met since that day. 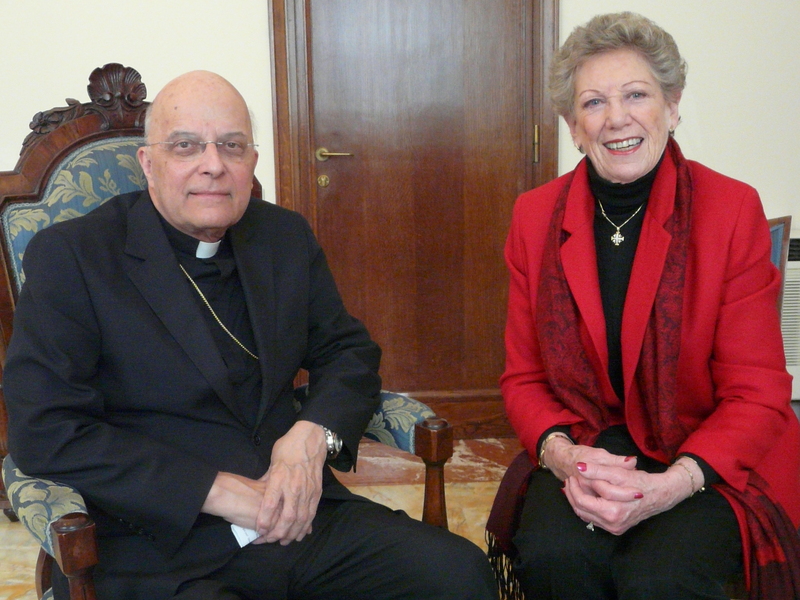 Cardinal George – whose funeral will be held on Thursday, April 23, the feast of St. George – was a guest ever so many times in my home in Rome and reciprocated whenever I was in Chicago by inviting me to the residence at North State Parkway for a meal. Every time we broke break was memorable, as you can well imagine. But there was one dinner in Rome we never had. You never had to ask Cardinal George to clarify something. He meant what he said and said what he meant, clearly, to the point, and purposefully. I called him every so often when it became apparent that our paths might not soon cross, either in Chicago or Rome. My intent was always to get an update on his health, to update him on happenings here and to perhaps interject a small dose of cheer and humor. Whatever his bill of health, whatever the pain and suffering he was enduring, I always came away from our conversations feeling that I was the one who had been uplifted! 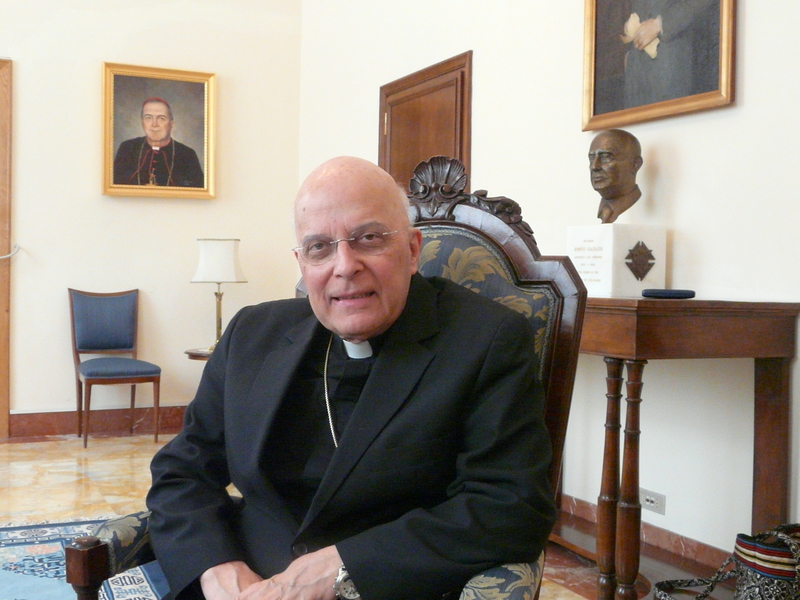 Whenever Cardinal George was in Rome for more than 48 hours, I arranged to have dinner at my place, always telling him to invite whomever he wished. On many occasions, especially when he was vice-president and then president of the USCCB, the other guests were the other USCCB officials in Rome with him on a working visit to the Holy Father and officials of the Roman Curia. Many dinners included priest and bishop friends in Rome, either from the Roman Curia or the North American College. Often his longtime director of Communications, Colleen Dolan, was also present. Fr. Dan Flens, his secretary and all around right-hand man – and true blessing as a friend – was always at dinner and it was a joy to host him because, fortunately for me, he was as comfortable in the kitchen as he was at the dining table! Each occasion was special and memorable and unique, just like Cardinal George. One very memorable evening was when I invited Archbishops Amel Nona of Mosul, Iraq and Bashar Warda of Erbil, Kurdistan, northern Iraq, to join us. 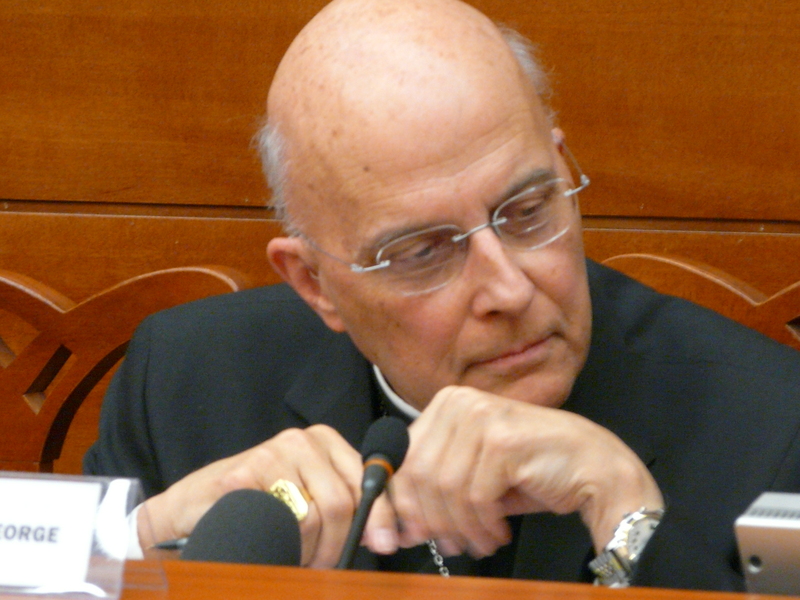 They were in Rome for the October 2010 Synod of Bishops on the Middle East, and the conversation was fascinating for countless reasons, one of which was that Cardinal George, as a missionary priest, Oblate of Mary Immaculate, had a keen interest in the Church around the world, having visited so many countries. With this missionary sense, he always asked the right questions and was able to brilliantly synthesize the answers to a question and analyze the whole picture. Archbishop Nona had been appointed to Mosul by the Chaldean Synod in January 2010 to succeed Bishop Paulos Faraj Rahho who had been kidnapped and killed by extremists. Aged 42, Abp. Nona (r) was the youngest reigning bishop in the Catholic Church at that time. A cheerleader for my first trip to Iraq in early 2010, Cardinal George had a keen interest in every detail I could recount about that trip during a separate dinner that took place before our evening with the Iraqi bishops. What did we talk about over my many dinner parties? In general – no surprise! – we spoke about the Church in Rome and around the world and the Roman Curia and the need for reform, but we also looked at the hot topics in world or U.S. news, politics, even sports. I’ve given scores and scores of dinner parties but never have I written about one, about what was said by whom around the dining table. That table, that space, my home, is sacred to me. My guests all know that, when we meet on the street or in a restaurant or even for an interview, I am a friend but also journalist, writer and vaticanista. However, as guests in my home, they know we are all friends who can enjoy good food and wine, scintillating conversation and lots of laughs, without anything appearing in print. Needless to say, if something came up that was absolutely newsworthy, I’d ask about reporting it on the record. Cardinal George was always willing to speak on the record and be interviewed for “Vatican Insider,” and we all learned a great deal from this extraordinarily erudite man, whether he spoke about a synod, an ad limina visit, a conclave (not divulging, however, the inside story of what actually happened inside the Sistine Chapel), the Jubilee Year 2000 or his time in Chicago. It was always fun to learn something new about the cardinal. When I heard that he liked ice cream, especially chocolate, I made homemade chocolate ice cream for one dinner party. I learned early on that his preferred after-dinner liqueur was Fernet Branca and since that night there was always a bottle in my home with his name on it, so to speak. I also learned that some of my meals became his preferred foods! One conversation I can write about: One night, we were all discussing cruises. Cardinal George said he had never been on a cruise ship nor was he drawn to the idea of being on a massive ship with thousands of passengers. However, he did offer the idea that, in retirement, he would like to take a freighter cruise where, on a large ship but with only a small number of guests, he could enjoy leisurely travel and visits to different ports and also spend quiet time reading and writing. Even on a freighter ship, Cardinal George would have been a delightful guest – interesting, interested in others, an avid and brilliant conversationalist and a terrific listener as well. I will miss all of that. I will miss his towering intellect. I will miss listening to every single word he said because they all counted – not one was wasted. I will miss his brilliant analyses of just about everything – Church issues, political matters, books, people, you name it. And I will really miss his laugh! What I will miss, however, perhaps pales in comparison to how Cardinal George inspired me. His rock solid faith, his deeply-held convictions, his inspirational and passionate explanation and defense of the Magisterium were his gifts to me every time we met or broke bread together. His courage and humility, his humor and wit, his great empathy – all qualities to be emulated. I have, of course, just touched the surface of my tales in this look back at the 17 years I shared a friendship with this saintly giant of a man.